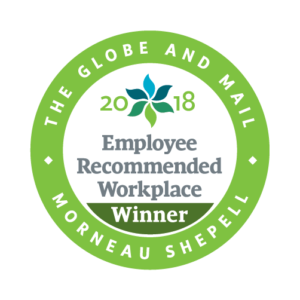 TORONTO, March 26, 2018 – On March 20, Morneau Shepell and The Globe and Mail announced the category winners of the second annual Employee Recommended Workplace Award at The Globe and Mail Centre in Toronto. These were the organizations with the top Total Health scores in their business categories, representing privately owned, public, not-for-profit, and government sectors in the small, mid-sized and large business categories. They will be profiled nationally in The Globe and Mail on Tuesday, March 27. About Morneau Shepell Morneau Shepell is the only human resources consulting and technology company that takes an integrated approach to employee assistance, health, benefits and retirement needs. The Company is the leading provider of employee and family assistance programs, the largest administrator of retirement and benefits plans and the largest provider of integrated absence management solutions in Canada. As a leader in strategic HR consulting and innovative pension design, the Company helps clients solve complex workforce problems and provides integrated productivity, health and retirement solutions. Established in 1966, Morneau Shepell serves approximately 20,000 clients, ranging from small businesses to some of the largest corporations and associations. With more than 4,000 employees in offices across North America, Morneau Shepell provides services to organizations across Canada, in the United States and around the globe. Morneau Shepell is a publicly-traded company on the Toronto Stock Exchange (TSX: MSI). For more information, visit morneaushepell.com. About The Globe and Mail The Globe and Mail, founded in 1844, is Canada’s foremost news media company. Each day, The Globe leads the national discussion by engaging Canadians through its award-winning coverage of news, politics, business, investing and lifestyle topics, across multiple platforms. The Globe and Mail print and digital formats reach 6.5 million readers every week, with Report on Business magazine reaching 1.6 million readers every issue in print and digital. The Globe and Mail is owned by Woodbridge, the investment arm of the Thomson family.